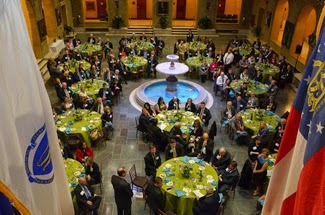 The USDA Whitten Building Patio was decked out on March 18, 2015, for the annual Celebration of Agriculture Dinner. Over 150 people were seated for a delicious dinner featuring pork provided by the National Pork Producers Council and prepared by the esteemed Mark Salter of Robert Morris Inn. The event kicked off with Sue McCrum, American Agri-Women, who presented Orion Samuelson, WGN Radio and This Week in Agribusiness, with the Veritas Award. The Award is presented by American Agri-Women to the person or persons who have given public witness to "the pursuit of truth" in accordance with the principles enunciated in the AAW Statement of Philosophy. Following the award presentation, Samuelson introduced the Outstanding Young Farmers in attendance: Jeff and Elaine Thomsen; Brian and Jennifer Harbage; Scott and Alissa Ferry; Christian and Julie Richard; and Patrick Zimmerer. Special guest for the evening was Michael Scuse, Under Secretary for Farm and Foreign Agriculture Services. Prior to this position, Scuse served as Deputy Under Secret. Prior to this position, Scuse served as Deputy Under Secretary for the FFAS mission area from 2009 to 2011 with primary responsibility over our domestic programs. Winners of this year's video and essay contest were honored. Each winner receives $1,000. The theme of the contest which was open to young adults, 9th through 12th grade, was “Agriculture. Sustaining Future Generations.” The contest is sponsored by: CHS with support from the National Association of Farm Broadcasting, the National Agri-Marketing Association and Penton Farm Progress. The winning video essay was produced by Harshin Sanjanwala from Madison, Mississippi and can be viewed on the Ag Day web site. 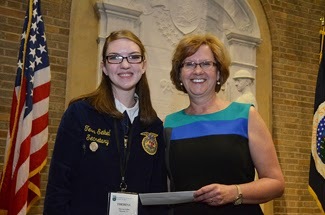 Annette Degnan, CHS, Inc., presented the written essay contest winner, Theresa Seibel from Roanoke, Virginia, with her check and Seibel read her essay at the dinner. The dinner also featured the presentation of the Charles Eastin Distinguished Service Award, which honors an outstanding individual who stands out as an advocate for accurate communications between rural and urban audiences. This year’s winner was Dennis Pennington with the Michigan State University Extension, Colin Woodall, National Cattlemen's Beef Association presented the award. This festive evening was a fitting and exciting tribute to the importance of American Agriculture and its vibrant future. Every year, producers, agricultural associations, corporations, universities, government agencies and countless others across America join together to recognize the contributions of agriculture. There's more at agday.org!